The main body of Later Journey to the West (Hou Xiyouji, 後西遊記, 17th-century) follows a similar trajectory as the parent novel, Journey to the West (Xiyouji, 西遊記, 1592). The historical monk Dadian (大顛, 732-824) is tasked with traveling from China to India to retrieve spiritual knowledge from the Buddha, and just like Tripitaka, he is protected by three demonic disciples, namely Sun Luzhen (孫履真), the descendant of Sun Wukong, Zhu Yijie (豬一戒), the son of Zhu Bajie, and Sha Zhihe (沙致和), the disciple of Sha Wujing. Along the way the group travels through many lands, battles numerous evils, and they eventually become enlightened Buddhas like their predecessors two hundred years prior. As noted in part one, Later Journey to the West may appear like a carbon copy of the original, but the similarities are only skin deep since the novel is comprised of extremely dense layers of allegorical meaning. Below, I present the last of a three-part summary of the novel (part 2), which focuses on the end of the journey. I rely very heavily on Xiaolian Liu (1994) as the novel has yet to be published in English. I don’t need knives or swords to kill you. With the writing brush, I can easily describe you as a heretic monk and write the words “Foreign religion,” which will crush you down, so you will never be able to stand up (p. 89). The demon then kidnaps Dadian and subdues him under the weight of the brush and a golden ingot. Monkey consults the god of literature in heaven and learns the monster’s brush is so powerful because it was originally used by Confucius to write the Analects. The group is finally able to defeat the demon and release Dadian with the god’s help. Fig. 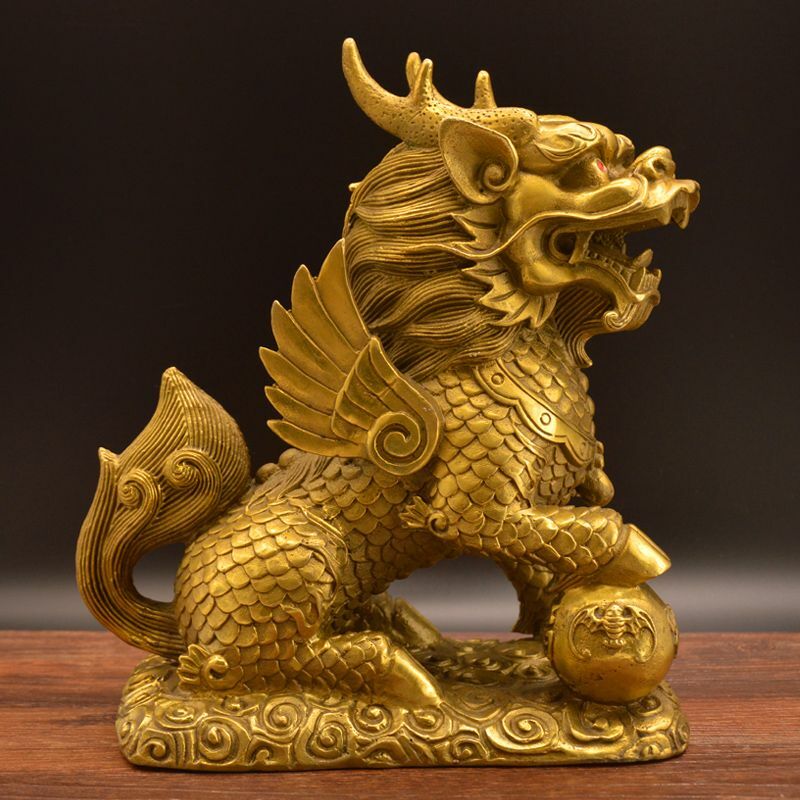 1 – A Qilin unicorn. This beast is often depicted with coin scales (larger version). Yijie arrives late covered with scratches and bruises from his rough journey. He questions how his companions traveled so easily, but realizes the error of his ways when shown the note. If the Monkey of the Mind is still and the Horse of the Will is tame, and your speed is neither fast nor slow, the road will be smooth and steady, and you will be able to reach your destination in an instant. Buf if the Fire of the Liver flares up, the plank road will be burned down; if the Wind of the Spleen blows, the platform bridge will be destroyed; if the Water of the Kidneys is dried up, the boat will be stranded; and if the Air of the Lungs is weak, the chariot cannot be driven. In that case you will be traveling all your life, groping in the Skin Bag, and never be able to get out (pp. 94-95) [F]. Fig. 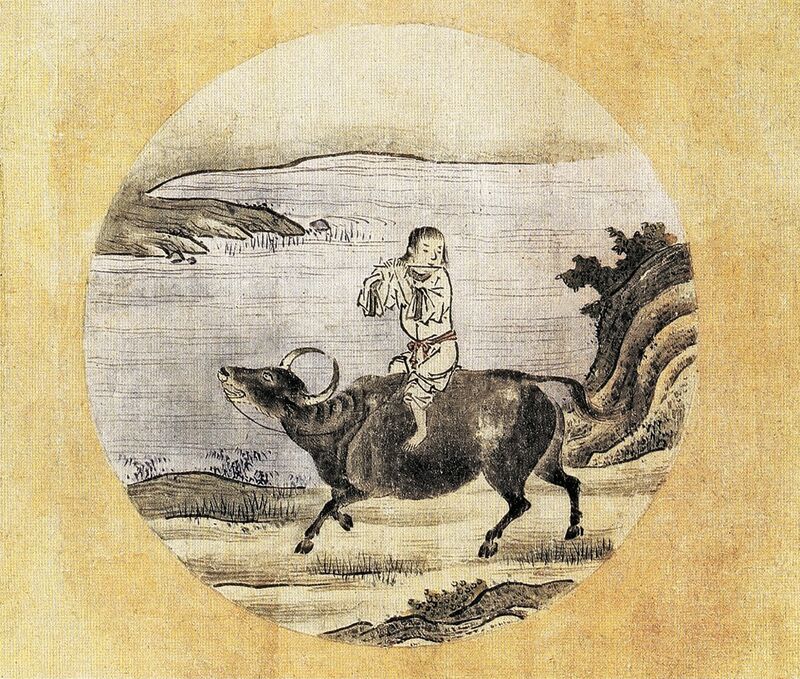 2 – The cowherd and his ox, a traditional symbol of enlightenment (larger version). Painting by Tenshō Shūbun (天章周文) (1414-1463). Dadian chooses the long path, but his disciples goad him into taking a boat, a forbidden shortcut, which initiates the chain of events foretold by the cowherd (actually a sage in disguise). The vessel eventually runs aground on the riverbed because the water dries up. The priest then mounts his horse once more, but Yijie slaps its behind to speed up, leading to a wild, uncontrolled ride that knocks the wind out of Dadian and dampens his will to continue. Angry, the master admonishes the pig, causing the group’s path to be blocked by a monstrous fire. Seeing the road to paradise blocked, Dadian is beset with anxiety, causing a terrible wind that forces the group to take shelter in the forest. [G] The pilgrims soon realize the obstacles arise from the monk’s mental state. When Dadian centers himself, the wind subsides. The path before them then becomes an easy one. Listen to what I have to say: The Buddha is merciful. Am I not merciful? The Buddha is wise. Am I not wise? The Buddha is vast. Am I not vast? The Buddha is divine. Am I not divine? The Buddha is void of the five qualities and I don’t have an inch of thread hanging on my body. The cultivation of the Buddha took ten thousand kalpas of time. But it only takes me an instant. In the most profound sense, I can exist without the Buddha, but the Buddha can’t exist without me. You should think carefully. In what respect am I inferior to the Buddha (pp. 104-105). Fig. 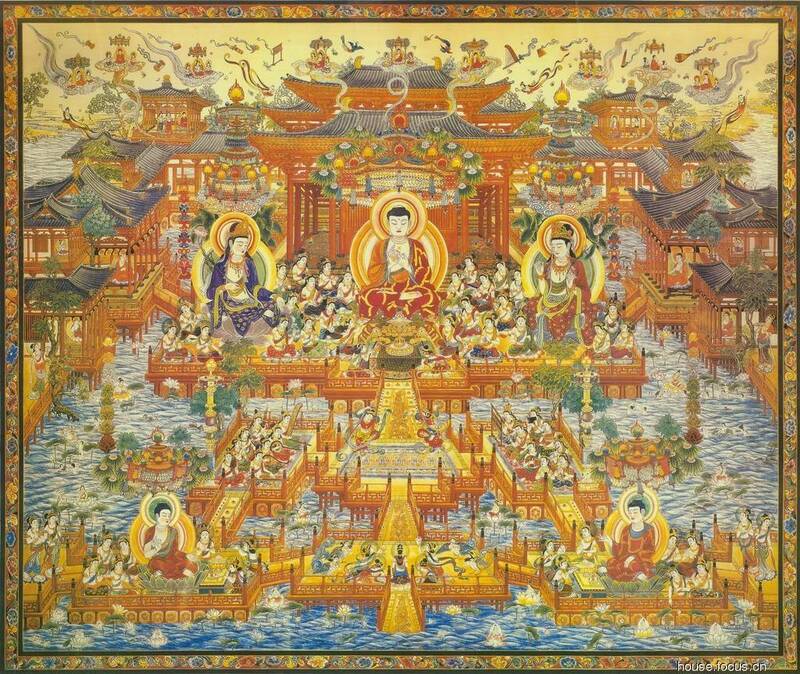 3 – The Buddha surrounded by a celestial retinue (larger version). But he releases the interpretations anyway. The group, having become enlightened beings, fly on clouds back to the Chinese capital of Chang’an, returning five years after the journey started. Emperor Muzong (唐穆宗, r. 820-824) welcomes the pilgrims and builds for Dadian a prayer platform from which he can read the scriptures. On the 18th day of the second (lunar) month of 824, the priest orders Luzhen to open the sutras that had been magically sealed by Tripitaka years prior. The Small Sage sends out a legion of monkeys all across the Middle Kingdom to complete this task. The resulting sermon enlightens the whole of China. The monk intends to finish reading the entire interpretation, but his lecure is stopped by the Laughing Monk who reveals himself to be the Buddha. Dadian and his disciples return to the Western Paradise with the Enlightened One and are bestowed with Buddhahood for their efforts. In the end, the Buddha shines light from his third eye onto China, transforming it into a paradise on earth. A) The name of the village refers to the classic method of teaching Confucian values through song (Xiange, 弦歌) in ancient China. B) The money and brush refer to the power and wealth belonging to the Confucian social elite. Monkey is impervious to the weaponized coins because, as a monk, he has no desire for money, but falls to the brush-spear because Confucians can sway public opinion about Buddhism simply with a few strokes of the brush. C) Division Ridge and the Temple of Division both serve as filters that separate (or divide) true believers from those still plagued with desires or negative emotions. D) The pass and Yijie’s troubles therein are metaphors for the negative mental states (or obstacles) that block someone’s path to enlightenment. E) The three peaks and the square inch are references to the Chinese character for heart or mind (xin, 心) (take note of the three dots on top of the character). This means the mountain is a metaphor for the mind. Those who master the mind and achieve enlightenment can take this quick path to paradise since they have already done the heard work of cleansing themselves of desires. This path is essentially located in the clouds, hence the name of the mountain. F) The skin bag is the human body. Each of the body parts and elements refers to a particular human emotion. Therefore, if a person doesn’t tame the emotions, they will forever be a slave to their bodily desires. G) Pilgrims on the journey to enlightenment create their own obstacles. The answer to this riddle is “the Buddha is in the mind”. Liu (1994) considers Monkey’s above statement about being equal and even superior to the Buddha to be the most important passage in the entire book because it demonstrates “Buddhahood is inherent in everybody’s nature and everyone is capable of becoming the Buddha through self-cultivation” (p. 105). [I] This refers to overreliance on the written word and spoken interpretations, a concept revisited many times throughout the novel. 1) These five qualities, or “Wuyun 五蘊 are the five mental and physical qualities or constituents (Sanskrit skandhas), i.e. the components of an intelligent being, especially a human being” (p. 116, n. 47). This means the Buddha and Monkey are not human. 2) Emperor Muzong’s father, Xianzong, dies during the course of the journey.